Starting this release, you will see a new summary page view along with a number of UI configuration for your gateway's settings. 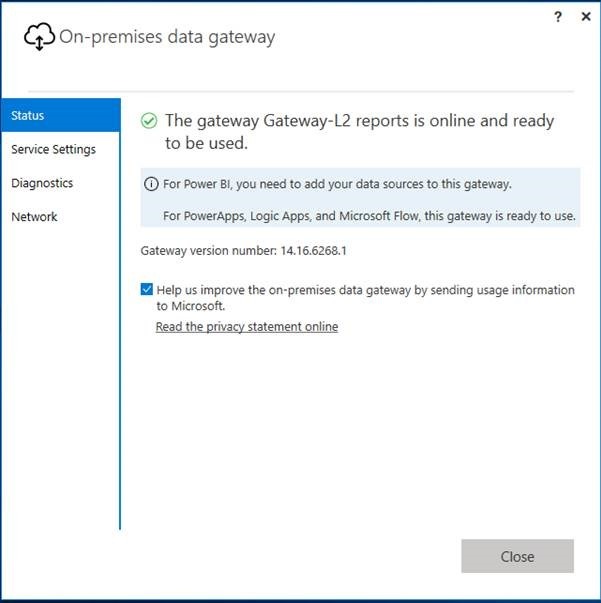 You can access this UI at any time after your gateway configuration, by simply searching for “On-premises data gateway” in the start menu. Current version number and a notification about a new version once it is available. This will restart the gateway Windows service. Staring this release, you can use the gateway's UI to change the Windows user's account the gateway is running under. 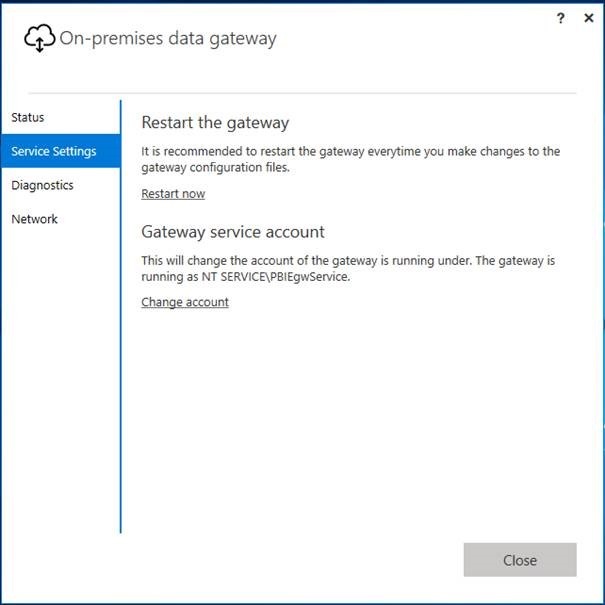 By default, the gateway will be running under "NT SERVICE\PBIEgwService", you can change this by clicking on "change account" which will ask you for the Windows account credentials you'd like to use to run the gateway under. 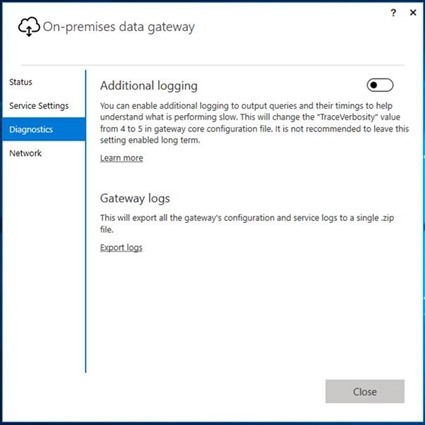 Changing the Windows account will take you through the gateway configuration page, so if you’d like to keep using the same gateway you've stared from, make sure you remember the Recovery Key before you proceed. Changing the Windows account will kick off the gateway configuration experience, so you need to sign in with the PBI service account again and choose "Migrate or Restore and existing gateway" to restore the previous gateway. 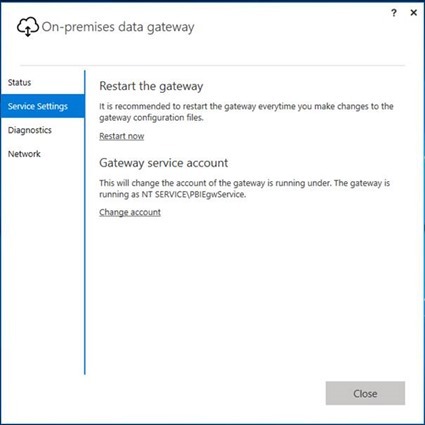 Once you've restored the gateway, you will have your existing gateway, with the gateway service running under the new Windows Account. Often times you need to do this if you have a locked-down environment and only local domain accounts can configure the gateway. You can enable additional logging to output queries and their timings. Make sure to switch it back to off once you've completed the investigation as leaving this on may impact your gateway's performance. Remember to click Apply and restart the gateway so this change takes effect. This will export all your gateway logs into a single .zip file to make it easier to share. 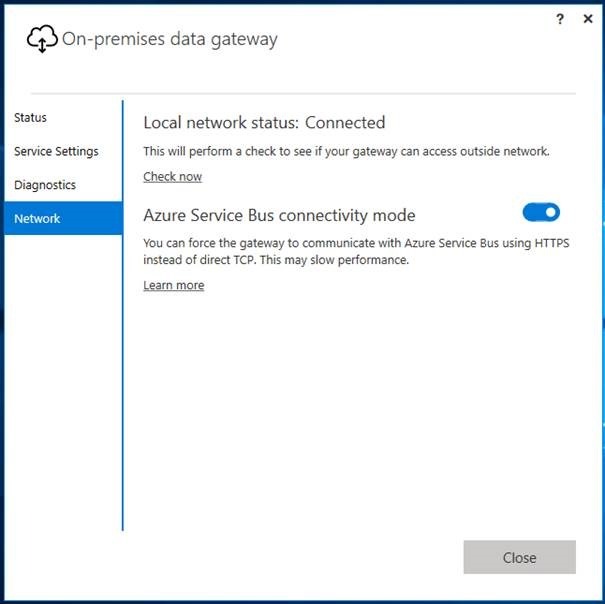 You can force the gateway to communicate with Azure Service Bus using HTTPS instead of direct TCP, or switch back to TCP. You need to remember to click Apply here and restart the gateway so this change takes effect. This will check whether the gateway can access the outside network. You can check this at any time. If you've been using HTTPS for your Azure Service Bus and Cloud services communication, you probably have been keeping a list of IP addresses based on your region, which is updated frequently. We've heard your feedback about the complexity of keeping track of this list, so we've added the capability to communicate via the FQDN instead of IPs. This feature was shipped in February's release, so some people may have been using it already. To activate, simply open the latest gateway release, go to Network: “Azure Service Bus connectivity mode”, switch the toggle to on, and finally click Apply to restart the gateway Windows service. Once it's restarted, this change will take place and there will be no network communication using direct IP addresses. We've made improvements to the way we do the network health checks. In addition to the updated checks, the error messages have been refined to be more actionable and help users understand what specifically failed during the network connectivity check, for example: "Gateway can't access the Azure Service Bus endpoint", versus "the gateway can't access anything outside the network". If you’re using an Oracle data source with your on-premises data gateway in an environment where you have Kerberos configured, leave a comment here, we’re looking for candidates for a private preview we’re running. That’s all for this month, we hope you enjoy these new features and continue sending us your feedback.